Brenda Wernikoff was arrested for refusing to leave a woman’s bathroom at a homeless shelter in Boston. The city of Boston has agreed to pay a transgender woman $20,000 in exchange for dropping her suit against the officers who arrested her on disorderly conduct at a homeless shelter, in a case that highlights the department’s absence of written policies for dealing with transgender people. The officers who arrested Brenda Wernikoff are now being investigated by the department’s internal affairs division. The department is also continuing to work on training its officers on how to interact with the transgender community. According to Wernikoff, Boston police did not just book her, they humiliated her. After she was arrested for refusing to leave a woman’s bathroom at a homeless shelter, she said four to five male officers at the South End police station forced her to remove her shirt and bra and expose her breasts. According to the federal lawsuit, “The officers then ordered Ms. Wernikoff to jump up and down, causing her breasts to jiggle” as the officers laughed. “I mean belly laughs,” Wernikoff said, describing the May 2010 incident. “The officers contend that was pure fiction. They are well-respected veterans of the department,” said Kenneth Anderson, a lawyer who is representing the officers in the department’s investigation. Cheryl Fiandaca, spokeswoman for the Boston police, declined to comment on the lawsuit, but she said top commanders have been meeting with leaders in the transgender community about such issues. “Currently, we are working with the Massachusetts Transgender Political Coalition to develop new policies to deal with various situations and issues of importance that could arise with the police and the community,” she said. Last Friday, the Boston Public Health Commission, which runs the Woods Mullen Shelter where Wernikoff was arrested, agreed to pay her an additional $10,000. Staff members at the shelter, who called police that day, were retrained after the incident, said commission spokesman Nick Martin. Wernikoff, 60, said she hopes police officers will soon have clear guidelines on how to treat transgender people. “It shouldn’t happen again to anyone,” she said. The City of Boston has long had an ordinance that says people have the right to use restrooms, showers, and dressing rooms based on their gender identity, a rule that goes beyond state protections of transgender people. The problem is that the city has failed to train many officers on its own ordinance, said Wernikoff’s lawyer, Howard Friedman, a well-known civil rights attorney. He pointed to departments in Washington, D.C., and Los Angeles, which make clear in their rules and regulations that officers are to address a transgender person by their preferred name and use appropriate personal pronouns. They also instruct officers to conduct searches in the same way that they would on a non-transgender person. Boston police did not follow those guidelines when they arrested Wernikoff, according to the lawsuit filed last November. Wernikoff, whose birth name is Bruce Wernikoff and who began identifying as a woman when she was in her mid-50s, had been staying at the shelter for about a year. She said she had nowhere else to go after she left her uncle’s home, where she felt unwelcome by relatives uncomfortable with her gender identity. Wernikoff was in a bathroom stall when a counselor, Margaretta Collins, came into the bathroom and told her she could not be there when other women were present. Collins said in an interview that her supervisor told her that transgender people at the shelter were supposed to use another bathroom on the floor. “For whatever reason, she chose to use the female’s bathroom and the females complained,” said Collins, who left her job about a month ago for health reasons. The Boston Public Health Commission’s policy stipulates that transgender women may use the women’s restroom and showers. Martin said staff members are instructed to follow the commission’s protocol. “If [Collins] was unfortunately given that advice by her supervisor that would have been a mistake,” he said. Collins said her supervisor called the police officer assigned to the shelter. Officer Loletha Graham-Smith appeared and ordered Collins to get out of the stall. “She was trying to be professional,” Wernikoff recalled. But she never asked for Wernikoff’s identification and refused to acknowledge Wernikoff by her gender, according to the lawsuit. At the booking station, the patrol officers repeatedly called her “Bruce,” Wernikoff said, and refused to let her reach for her wallet so she could show them her driver’s license, which showed she had legally changed her name to Brenda. Officer Edward Fleming booked Wernikoff and Officer Frank Chiola searched her, according to the complaint. The officers did not give her a private space to change and did not ask whether she wanted a woman to search her instead, according to the complaint. Prosecutors later dismissed the disorderly conduct charge against Wernikoff. 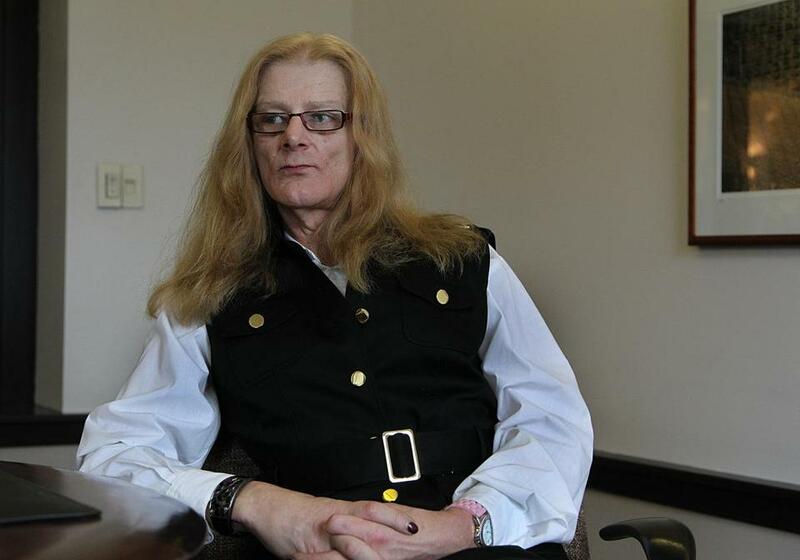 Gunner Scott, executive director of the Massachusetts Transgender Political Coalition, has trained Boston police recruits in dealing with transgender people and said he is confident the department will draft a policy soon. Last spring, he provided the department with a copy of the Washington, D.C., police policy as an example of what it should adopt. But Scott said his agency still receives complaints from transgender people that police sometimes do not take them seriously and often refer to them as as sir or ma’am, in contrast with their gender identity. “Whether the person is a victim or assumed to have broken the law, transgender people should be treated with respect and should not be demoralized,” Scott said. He praised Wernikoff for filing the lawsuit. Wernikoff, who is now in a committed relationship and taking care of her ailing mother, said she tries to avoid police. Maria Cramer can be reached at mcramer@globe.com.